Icebergs. Giant icebergs. These are synonymous with the city of Ilulissat, which also means "icebergs" in Greenlandic. The town is located at the mouth of Ilulissat Icefjord, with the most amazing scenery in the form of colossal icebergs. These icebergs continually calve into the icefjord from the most active calving glacier in the northern hemisphere. Kangia, as the fjord is known in Greenlandic, was admitted to UNESCO's World Heritage List in 2004. Ilulissat is a must see destination, even for Greenlanders. Ilulissat is located 350 km north of the Arctic Circle and has everything that represents Greenland for most visitors: Midnight sun in summer, northern lights in winter, whales & seals, lots of sled dogs, historical sites from the first Inuit cultures at Sermermiut, beautiful wooden houses from the colonial era, educational institutions, sports activities, etc. 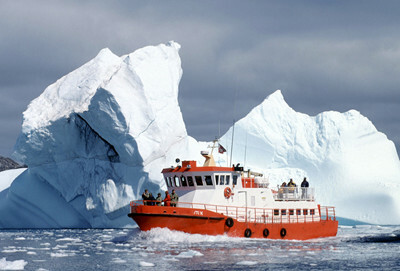 Ilulissat has undeniably the largest variety of excursion opportunities for visitors to Greenland. In addition, you can indulge yourself with good food and drink at the city's lively restaurants and cafés, while you digest each day’s exciting impressions. Many say, "Well, we can walk around the city". Yes, you can, but on this guided city walk we delve much deeper into the history, culture and stories of Ilulissat. Our guided city tour is an easy shortcut to good knowledge and precious stories only locals can tell. 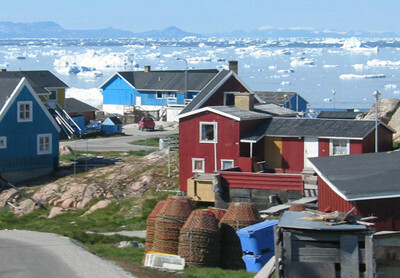 Ilulissat was founded in 1741 and is today Greenland's third largest city with over 4,500 inhabitants. 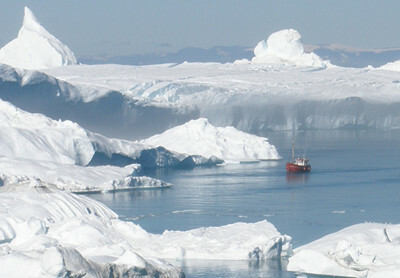 The name 'Ilulissat' means 'icebergs'. Sermermiut or the "glacier's place" is an historic settlement located on the outskirts of Ilulissat, reaching right down to the ice fjord. The 3 main Inuit cultures lived, hunted and fished at this location, with the first migration from Canada being the Saqqaq people approx. 4,500 years ago. They were followed by the Dorset and Thule people. You’ll hear fascinating stories of these people and see evidence of where they lived their harsh lives. This is a beautiful guided hike along the Kangia Icefjord. Here we combine all our Sermermiut tours and add an extra dimension when the guide tells about flora, fauna, geology and of course the story of the ubiquitous ice. We find that many guests feel more confident of having a tour guide accompany them for their first walk in the Greenlandic mountains. On this excursion we invite you to visit a team of sled dogs. You can see, touch, smell and especially, hear the up to 20 excited dogs barking for attention. 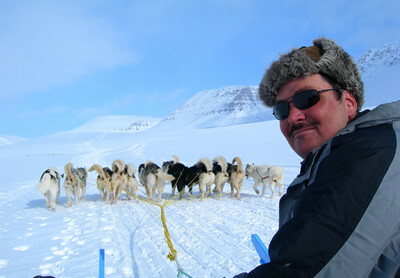 The dog owner will show you their sled and equipment, while telling a bit about the life of a Greenlandic sled dog. 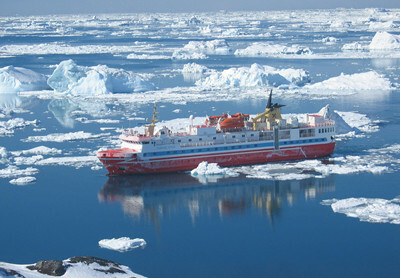 Boat trips in Greenland and experiencing an icefjord cruise from Ilulissat is a must. You’ll have countless opportunities to take amazing pictures of the huge icebergs during your icefjord cruise, where the largest icebergs lay grounded on the underwater moraine at a depth of 350 metres. Experience this natural phenomenon from close proximity while gaining insight into the fascinating world of glaciology. You’ll learn about ice in its many forms and the effects of climate change in the Arctic are also discussed. Other boat trips to settlements and whale watching cruises are also wonderful. The fresh air and unique light provide a special ambience. Remember your hat and mittens! 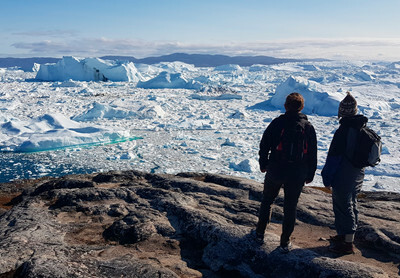 Cruise from Ilulissat harbour to the glacier front, where the largest icebergs lay grounded on the underwater moraine at a depth of 350 metres. Observe this natural phenomenon from close up while gaining insight into the fascinating world of glaciology, in the form of ice on the ice cap and its calving at the glacial front approx. 65 kilometres away in the fjord. The effects of climate change here in the Arctic are also explained. To the south of the icefjord lies the settlement of Ilimanaq in beautiful surroundings. Ilimanaq has a number of beautiful old colonial buildings and is known for the fine trout caught in Tasiusaq behind the settlement. Many mountain hikers are attracted to the nice hiking opportunities from the village, and spend a night or two camping in the area. Isolated small communities are something special in Greenland. They have both Internet and flat screen TVs, but life flows at a different pace. Oqaatsut, also known as Rode Bay, is beautifully located north of Ilulissat. Oqaatsut has approx. 45 inhabitants, a school, church, grocery store, and even the small restaurant "H8". 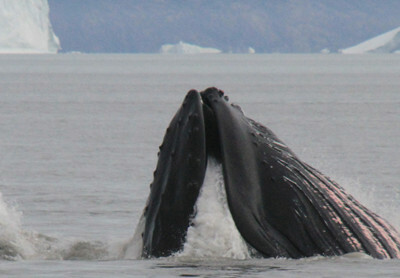 Visitors are surprised at how close the big animals such as whales can be seen. 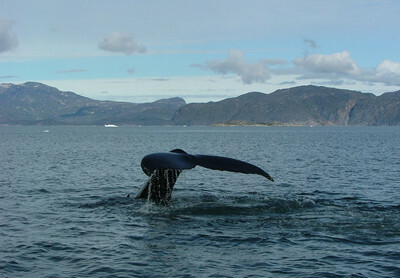 In Greenlandic waters there are about 15 species of whale commonly seen. Three of these spend winter here, namely the beluga whale, the narwhal and the Greenland whale. The blue whale and killer whale are rarely seen. Few places in Greenland are as beautiful as Eqi Glacier, which flows into the fjord 80 kilometres north of Ilulissat. 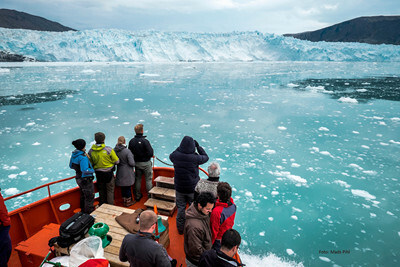 By boat it’s possible to navigate right to the edge of the glacier front and observe ice calving into the fjord. The resounding crash as ice falls into the water is breathtaking. Flightseeing by helicopter or fixed-wing airplanes over Kangia Icefjord to the glacier front. If you’d like to see where 43 million tons of ice annually break from the ice cap, these flightseeing tours are perfect for you! Flying over the icefjord you’ll see the massive icebergs on their journey from the glacial front into the fjord, and beyond. The helicopter stops for 30 minutes at the edge of the ice cap, where passengers receive an on-the-spot lecture about the ice. The fixed-wing aircraft fly a slightly different route, but there is no mid-tour landing. It’s an amazing experience to see the icefjord region from the air. This helicopter flight is one of the 2 options to fly over the UNESCO area. The region at the extreme edge of the glacial front is inaccessible to boats and hikers. With a calving volume of 43 million tons of ice per year at a speed of 50 meters per day, the Ilulissat (Kangia) Glacier is the most active calving glacier outside Antarctica. The glacial front is seven kilometres wide and over 1 kilometre thick. The seemingly endless flow of ice and the enormous natural forces at play are an unforgettable, awe-inspiring sight. Fly north along Ataa Sund - the same route as our daily boat trip to Eqi Glacier. Quickly reaching the far side of Paakitsoq fjord, you’ll fly by Glacier Lodge Eqi and then turn around just past the glacier. The flight follows the edge of the ice cap in a southerly direction where you’ll see mountains and lakes at the ice edge. On the other side of the Dead Glacier, the vast area of Sermeq Kujalleq opens up - the huge glacier, which produces all icebergs in Kangia Icefjord. We fly in a figure-8 formation here, to see the glacial front from all angles, before finishing with a flypast of the icebergs drifting in front of Ilulissat. A very impressive experience. This fixed-wing flight is the second opportunity to fly over the UNESCO area. 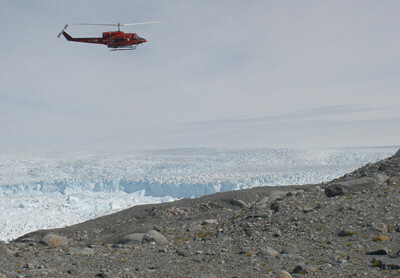 Similar to the "Kangia Classic" helicopter tour, however the plane cannot land at the ice edge. Instead, it flies around the settlement of Ilimanaq on the way back. 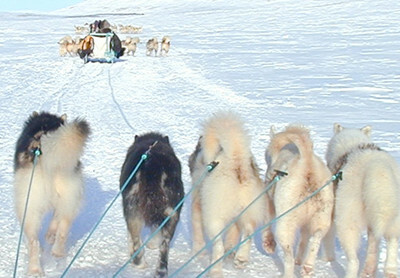 Winter and Ilulissat are synonymous with dog sledding. Ilulissat is Greenland's largest sled dog district with approx. 4000 Greenlandic sled dogs. The hinterland behind the mountain "Akinaq" offers great dog sledding trips to the icefjord or "The Dead Glacier" with durations from a couple of hours to a few days. A team of strong and eager sled dogs in a fan formation pull the sled, while the crisp air fills your lungs - it doesn’t get much better! In addition to dog sledding, there are northern lights, clear starry sky, lots of snow and fresh clear air, making the Ilulissat area an amazing winter destination. The dog sled is one of the best known icons of Greenland – a 2000 year old Inuit tradition. Not many means of transport have endured over such a long period of time. The basic principle is still the same as before the Viking Age: Dogs in harness tied to a simple wooden sleigh. The experience cannot be explained — it must be tested! 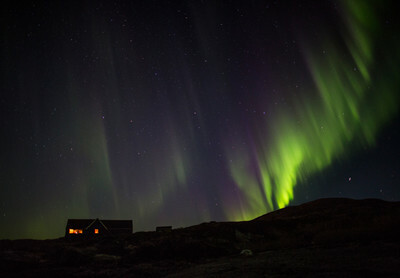 On winter evenings with clear skies, the beautiful Northern Lights appear above Ilulissat. We head where the sky is darkest, away from city light pollution. The guide will explain a little about the phenomenon and give tips and tricks on how to best photograph the colours dancing across the night sky. You’re welcomed into our peat hut in the mountains, where you can wrap yourself in the skins made from Greenlandic fauna. Our guide will introduce you to the legends and myths which have been told through generations. During winter we keep an eye out for the Northern Lights dancing across the sky outside. Due to the snow-bedecked winter landscape, it can be difficult to explore the World Heritage area during winter. Markings on the longer hiking routes are often covered with snow, but with a local guide and snowshoes it is not only easier, but also safer and more fun. 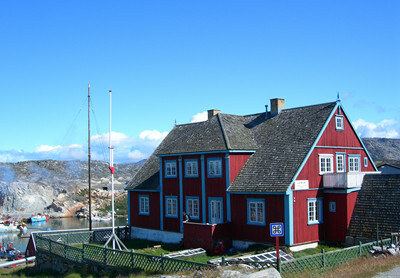 Ilulissat Museum was Polar explorer Knud Rasmussen's childhood home, where he was born in 1879. Learn about local history and of course the life of the well-known polar researcher and his many expeditions. The museum features three permanent exhibitions: the Town and settlement history, Knud Rasmussen and the Arctic expeditions, as well as Sermermiut — the great settlement of the Icefjord. 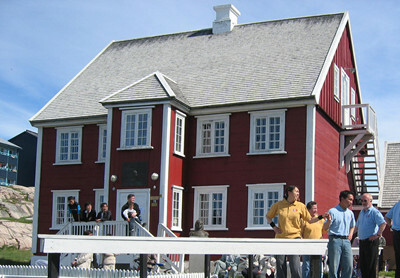 Ilulissat Art Museum is housed in the fine old colonial manager’s building, overlooking the harbour. The museum houses a permanent exhibition of works by Greenlandic painter Emmanuel A. Petersen, along with a series of changing exhibitions by emerging and established Greenlandic artists. Ilulissat has a number of excellent restaurants and eateries offering a wide range of culinary experiences. 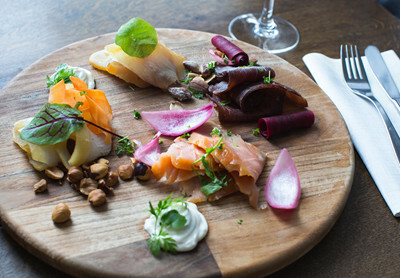 Several good restaurants place emphasis on fresh Greenlandic ingredients. "Everything good from the sea" is no exaggeration here, where local fishermen land halibut, redfish, stone bites, cod, catfish, salmon and char. Add to this snow crabs, shrimp, scallops and blue mussels, and you’re halfway through the Greenlandic buffet. In addition comes reindeer, muskox, South Greenlandic lamb and the more exotic features like whale, seal and maybe Polar bear! All this can be enjoyed with wine or good Greenlandic beer. 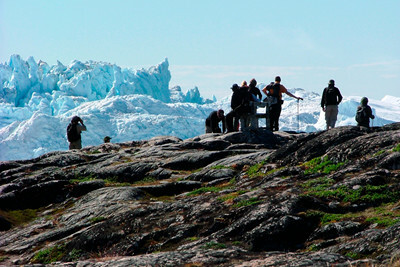 Hiking is a favourite outdoor activity in Ilulissat for both locals and visitors. 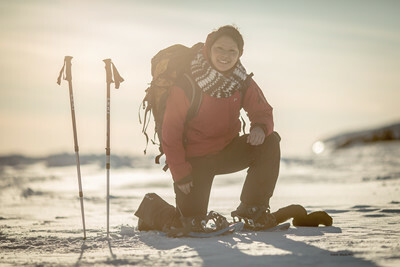 There are well-signposted trails which guide the hiker safely through the mountain scenery and to fascinating vantage points over the Icefjord and Disko Bay. Hike durations are from approx. 45 min to 3 hours.